Conference Archives 2014 | Who Can You Tell? 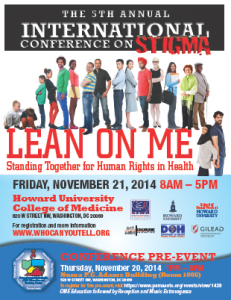 The 5th Annual International Conference on Stigma, “Lean on Me! Standing Together for Human Rights in Health” took place at the Howard University College of Medicine on Friday November 21, 2014, from 8 AM to 5 PM, located at 520 W St, NW, Washington, DC 20059.